Physics: static electricity, electric charges and law of charges. The is a form of energy that occurs when electrons flows through a conductor. Static electricity is produced by the friction between two materials. For example, when rod is rubbed with silk. 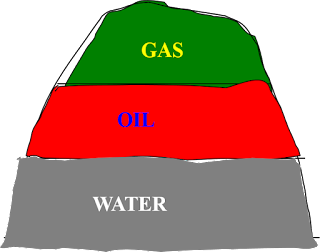 A reservoir science is the science of the study of porous rock and accumulated fluid (Petroleum + water). Reservoirs are formed from the consolidation of permeable sediments moved and deposited by fluid medium on the earth surface from a ‘source rock’. All reservoirs are of the sedimentary structure and hydrocarbons are trapped within the structure by deformation force upon layers at high temperature (structural trap) or by the depositional environmental changes in lithology. Petroleum: This consists of natural gas, crude oil ,condensate and constituents (Nitrogen oxide, hydrogen sulfide, carbon (iv) oxide etc). It is referred to as a mixture which is complex, of hydrocarbons (compounds containing hydrogen and oxygen only) and other constituents depending on composition, temperature, pressure etc. Dry Gas: No liquid just methane. Wet gas: contains liquid droplet with an API gravity of 50-70°API. Acid gas: contains carbon (iv) oxide. Sweet gas: Does not contain hydrogen sulfide. Sour gas: contains hydrogen sulfide. Apparent molecular weight, Density, Specific gravity, Specific volume, Gas formation volume factor, Gas isothermal compressibility etc. This is a hydrocarbon mixture of individual oil components. The quality is measured in terms of API gravity. Fluid gravity, Oil density, Oil formation volume factor, Specify gravity, Surface tension, Isothermal compressibility, Total formation volume factor etc. Gas condensate are hydrocarbon in which at certain conditions of temperature and pressure has led to the condensation of heavy gas in the reservoir. It occurs at critical temperature and pressure conditions. All reservoir rocks are sedimentary rocks for example sandstone, carbonate, evaporates etc. Other types of rocks like; Igneous and sedimentary rocks cannot form reservoir rock because of their source of formation, structure and properties. Porosity: This refers to the fractional void space within the reservoir rock that is available for storing fluid. Permeability (K): this is a property of porous medium which measures capability of rock formation to transmit fluid. It is the interconnection of void spaces to enable transmission or flow of fluids. Its S.I unit is in Darcy. These properties help to measure the value of Voltage Resistance and measure of ease with which current will pass through. They include; Resistivity, Conductivity.